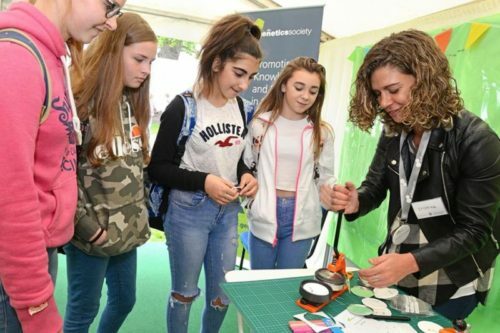 The Genetics Society used a corner of the Roslin Institute tent at the Royal Highland Show to trial activities to promote The Genetics Society to people of all ages. Cristina measured heights and attached ages of interested participants to explain that height is a normally distributed trait that is not entirely dependent on age. Other activities included making badges and constructing chromosomes from coloured beads threaded onto pairs of coloured pipe-cleaners to explain inheritance of genes from parents. 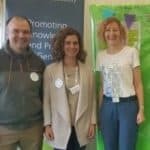 Committee members Professor Stefan Hoppler (Area C, Left) and former Honorary Treasurer Professor Anne Donaldson (right), both from the University of Aberdeen, meet up with Cristina Fonseca, the recently appointed Genetics Society Centenary Officer at the Royal Highland Show 2017. The Genetics Society thanks The Roslin Institute, Edinburgh University, for supplying space in their stand.